It is still winter. I know it's February and that February means winter and so I should expect that it would be winter, but man, it is still winter. The thing is, that by now, the last day of February, it feels like we should be almost finished with winter, but I suspect that isn't the case. We had a pretty un-wintry December and January, and the late descent of winter is depressing with its cold and snow. It's the kind of weather that makes me want to hunker down indoors and read and knit and cook hearty meals, but the tricky thing about that (at least where cooking is concerned) is that I have to leave the house for groceries, and this weather makes me not want to go outside. Obviously I have to, but I'm doing it as little as possible, so instead of heading to the grocery store every time I feel like cooking, I've started turning to Julia Child instead. Her memoir My Life in France (written with her nephew Alex Prud'homme) is full of food and warm weather and it is exactly the kind of delicious escapist read I need to get me through the depths of winter. In a nutshell, My Life in France is the story of the Childs' (Julia and her husband Paul) life abroad. They moved to Paris shortly after the Second World War and Paul worked as a cultural diplomat while Julia cast about for something to do. When she set upon cooking, she signed up for the Cordon Bleu and as dismayed to find she'd been placed in a class for housewives. After some trouble from the woman who ran admissions, she managed to be transferred into the main chef's class and although she didn't find success immediately, she was so determined to learn and so interested in everything that she, of course, was successful in the end. She became friends (as much as you can be, I suppose) with the chef who taught her class, and began working on her own recipes and versions of recipes in the evenings after class. She was, in a word, obsessed, and it was an obsession that drove her for the rest of her life. The first part of the book is mainly about Julia's introduction to French life and learning to cook and all the many amazing meals she and Paul enjoyed. It is also about their marriage, and their life together, which adds a perhaps unexpected love story to a memoir largely about food. It is so vivid and exciting to read that, really, you feel you could step right into that Paris and bump into her on the street. The second half of the book – no less enjoyable – is about the famous cookbook, or "cookery bookery," as Julia called it. Mastering the Art was an enormous undertaking. During the writing of it, the Childs were transferred from Paris to Marseille, meaning Julia was quite some distance from her writing partners (who, I should say, were the original forces behind the book, although that largely changed when Julia joined the team). The number of hours and ingredients that went into perfecting each recipe is unimaginable, and that these women did all this work without a proper commitment from a publisher is crazy. For a long time, it looked like the book might never even be published, since it was so long and detailed, and the market for that kind of cookbook didn't really exist in 1950s America, where they were hoping to sell it. Nonetheless, they persevered, and although the Childs were then transferred to Germany, and then to the U.S., and then to Norway (I had no idea they'd moved around so much), they didn't stop working. 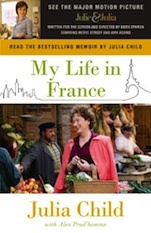 Although non-fiction is not generally painted as an escapist genre, My Life in France is absolutely a book that will whisk you away and drop you into Julia's kitchen. The writing appeals to every sense, and if you have ever heard Julia Child speak, her voice will follow you loudly through the pages. As memoirs go, this one is detailed and fun without losing the narrative and becoming too revealing. 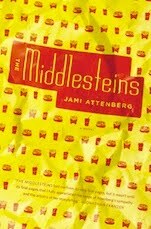 It is a delicious read, and I heartily recommend it.